Abbazia di Santa Maria del Piano – a site that had been on my list for a very long time! This magnificent ruin is set in the beautiful context of the Parco Regionale dei Monti Lucretili, a vast protected area east of Rome in which I’ve already hiked several times (to the highest elevations, the Gennaro and Pellecchia mountains, and the tiny karstic lakes of Percile). The region experienced a very dynamic and rich religious history, ranging from the testimonies of early hermitism (several hermitages are on my list for future Latium Mirabile adventures!) to the church, convents and monasteries that were built especially in the 11th century A.D.
Santa Maria del Piano is a fascinating site, one which deserves a better state of conservation and promotion. It is a testimony to an age in which the Benedictine order, from the nearby powerful abbeys of Farfa and Subiaco, settled the lands of Lazio and made their presence tangible with magnificent works of religious art and architecture. I felt like in a Caspar David Friedrich painting inside the collapsed nave of the Abbey. Santa Maria del Piano is believed, according to local legend, to have been built during the 9th century, when Charlemagne himself defeated a Saracen army at nearby Pozzaglia Sabina: the story is apocryphal and nowadays believed to be nothing more than a glorified legend. Our only certainties are the name of the Abbey occurring in the register of nearby Farfa in the 11th century and the beautiful inscription on the façade reciting Bartholomeus hoc op fieri fecit 1219, telling us that a certain presbyter by the name of Bartholomew restored the building in 1219, providing us with a very valuable terminus post quem. Enough Latin already? Nothing particularly meaningful seems to have occurred throughout its history, but the abbey underwent a slow decay from the 1500s onwards until the suppression of religious orders by Napoleon, in the early 19th century provided the final “coup de grâce”. After that, according to local history, the abbey was used a graveyard for those who perished in the cholera epidemics of the 1850s and was only relieved of its funerary purposes in the early 20th century. and medieval inscriptions are still present in the structure, not unlike many churches in the city of Rome, or the animal figure under the rose window. In the chronicles we hear of splendid bas reliefs (such as that of a Lombard hunting scene!!!!!!) or even the cosmatesque rose window itself having gone missing, most likely in some private collection as is the fate of so much ancient art. The abbey is built according to what is known as Tau-shaped, or crux commissa plan (where the transept is positioned at the end of the nave), with a double apse. The ruins to the side belonged to the convent to which the 20-metre tall bell tower was also attached. The bell tower stands out for its beautiful sequence of mullioned windows and upon entering the structure it is evident that the bell (which turns out has a fascinating history of its own, as a history of local rivalry between the towns of Orvinio and Pozzaglia Sabina) could be reached from a staircase from the convent. 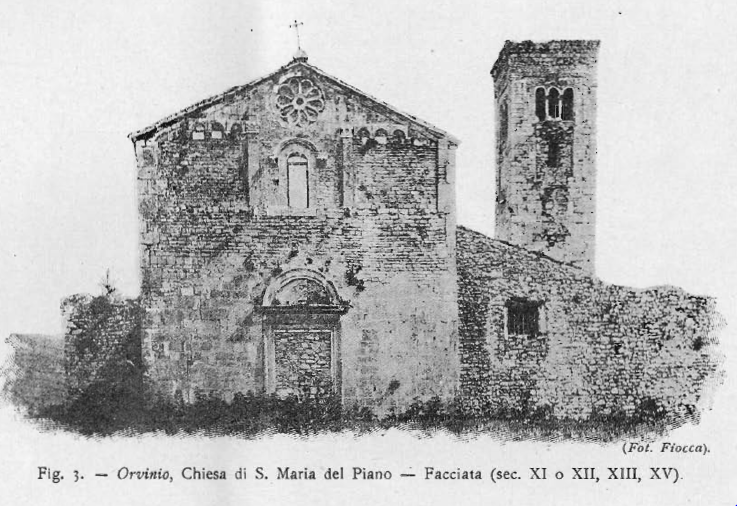 I visited this site alone, at dusk, and imaged the magnificent decorations and the thriving life of this monastic community surrounded by the forests and rural landscapes of the Monti Lucretili, when there most likely hamlets and villages mentioned among the abbey’s possessions which have now disappeared and only belong to the toponymy of places. It seems like other than an attempt to add the site to the “Luoghi del Cuore” listed by the heritage organisation known as FAI, little else has been done for this site. Its decadent state adds to the mystery and enchantment of the site, but what will be the cost to its cultural heritage? There are no keep-out signs or CCTV but there is a fence around the site which I believe may have been left behind after the recent restoration works. It is clear, however, that people have been entering the site. If you choose to do so, please be careful and respect the site – it is, after all, a historical ruin. If you choose Santa Maria del Piano as your destination on Google Maps and you are driving there, you will most likely end up at La Vaccheria, just off the road to Pozzaglia Sabina. I wouldn’t recommend this option, even though the owners of the farm are friendly, as this is private property and you still have to park and walk a 1.5k trail. Looking inside the apse from the ruins of the convent. Notice the medieval inscription.